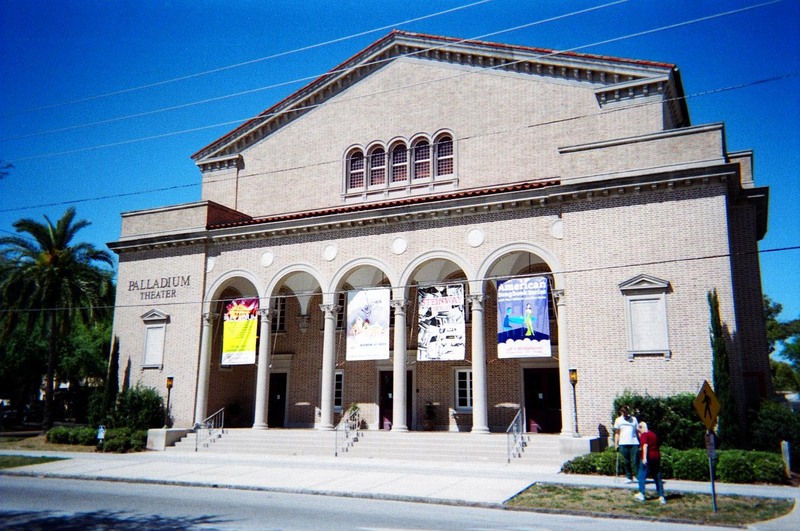 The Palladium Theater in St. Petersburg, Florida, is located in the former First Church of Christ Scientist, built in 1925. It is located in the North Shore Historic District. 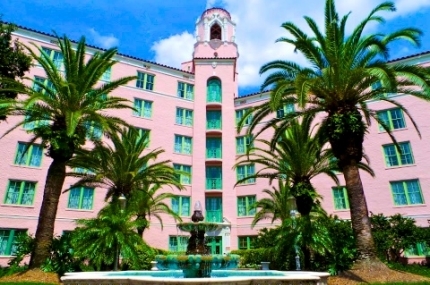 The historic Vinoy Hotel in downtown St. Petersburg is a pink Mediterranean revival-style building that overlooks the waterfront on Tampa Bay. It is one of many buildings in St. Petersburg listed on the National Register of Historic Places. St. Petersburg, Florida, (population 248,232) is located on the Pinellas peninsula between Tampa Bay and the Gulf of Mexico. The city was formally incorporated in 1892. Claiming to have 360 days of sunshine a year, St. Petersburg has been nicknamed the “The Sunshine City” and is a popular tourist destination. During the early 1900s, the creation of St. Petersburg’s waterfront park system, the incorporation of a trolley system, and the construction of the Electric Pier drew additional tourists and new residents. The city’s first real estate land boom began in 1909 and lasted until the start of World War I. The 1920s brought Mediterranean Revival architecture to St. Petersburg, including such buildings as the Vinoy Hotel, the Jungle Country Club Hotel, the Princess Martha, and the Snell Arcade. In 1926, the Florida real estate boom collapsed, but with the help of Public Works Administration projects in the 1930s, St. Petersburg again experienced a period of growth. As development spread westward, St. Petersburg’s downtown district fell into decline. Today, the city is again entering a period of revitalization, including the restoration of many historic buildings. The 1925 Manhattan Casino, formerly the Jordan Dance Hall, once hosted such legendary performers as Louis Armstrong, Count Basie, Duke Ellington, and Cab Calloway. The city purchased the building, which had fallen into disrepair, and is restoring it for use as retail, office, and banquet space. Another restoration project is the 1923 Mercy Hospital, the oldest surviving hospital building in the city and the primary care facility for the city’s African Americans until 1966. A new clinic now operates next to the old building, which is being renovated to house a museum of African American history. Visitors to the Heritage Village at Pinewood Cultural Park can explore a 21-acre living history museum with 28 historic structures, including homes, a one-room schoolhouse, train depot, blacksmith shop, and a general store. A walking tour brochure guides visitors through the city’s Historic Downtown District to view 82 historic homes and public and commercial buildings.